Star of Mysore (SOM): In spite of being a very successful actress, you did face financial crisis at a very young age itself. Does stardom make people become careless? 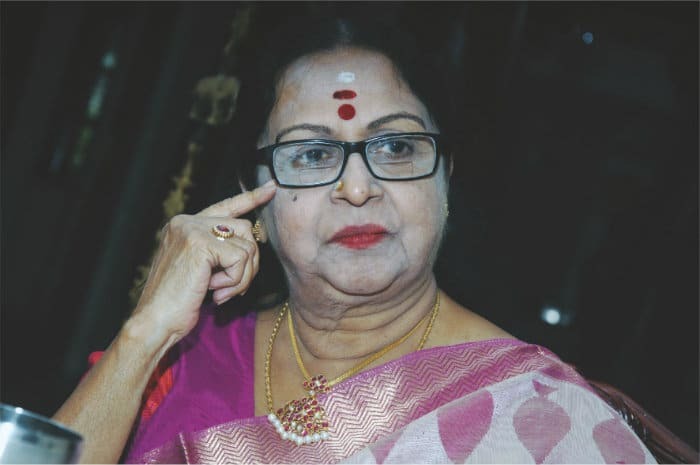 Saroja Devi: You are right, I had to pay a very heavy price. Income Tax is something that nobody can escape paying. We have to pay whatever taxes or due. But what usually happens to film stars or even many others is they end up buying sarees, jewellery, invest in houses and neglect paying their taxes. If we don’t pay taxes like property tax, income tax, then they attach properties. So I have kept a separate account for paying taxes and I pay all of them on time. This year I am ready to pay the property tax. There was a time in the early stage of my career without knowing I invested heavily in the properties out of my earnings but did not pay income tax. A time came when my property in Madras came up for auction and a few others were sealed. I was sitting forlorn on the swing in my house one day thinking all my earnings so far are being taken away from me. Someone came and draped a shawl around me. When I turned and looked it was my husband (yejamanru). He told me, ‘Why are you worrying so much? I get my salary. You do not have any habits as you neither drink, nor go to the races, or play cards. Even if you lose everything do not worry; we can live comfortably with my salary.’ It was such a load off my back. It gave me so much of confidence from his soothing words. Then he went to Delhi and sat with the income tax people. Right from what I earned in my first movie till the last movie everything was calculated. I ended up paying Rs.60 lakh taxes. But my husband told the IT authorities, ‘Look if she had not paid her taxes, you would have hounded her. She might have even ended up committing suicide. Many other stars are also in the same situation. After all, the shelf-life of a star is very limited. They need to save money for their rainy days. You have taken Rs.60 lakh but now my wife is not acting in many movies.’ They were convinced by my husband’s argument and gave concession but advised him to see that taxes are paid regularly every year. Immediately my husband came back, invested my money properly and saw to it that I had a monthly income whether I had a movie or not. Added to this my mother kept on pestering me as she felt that since I was very young and had enough wealth there should be a man in my life again to protect it. But from a young age I did not feel like falling in love. Most of my friends were all girls and I used to spend a lot of time with them. A few women do develop friendship with men; there is nothing wrong with that. Even getting married again is not wrong. May be they need security. SOM: Unlike many heroines who fade away or become recluse, you still remain in the spotlight. What is it that keeps you alive and kicking? Saroja Devi: Nothing special about that. If anyone invites me for a function that I feel important I attend. I move with everyone and talk to everyone. I have always been close to Rajkumar’s and Sivaji Ganesan’s family. I attend all the celebrations at their home. Recently I attended actress Lakshmi’s son’s wedding. I was literally mobbed. Everyone wanted to take photos with me. My PRO quietly sneaked me away from there and brought me to the car. At this age I cannot handle so much of stress. SOM: At the peak of your career and with a great fan following did the thought of entering politics come to mind? Saroja Devi: The late Prime Minister Rajiv Gandhi did call me to Delhi. Congress had lost the elections then to Janata Dal and V.P. Singh became the Prime Minister. Rajiv Gandhi invited me to his house. I had taken a white rose and gave it to him. He said, “Sonia will like this.” I still have that memorable photograph with me in the house. Unfortunately, people do not know history and the sacrifices of many leaders like them. I was in Delhi with my husband the day Indira Gandhi was assassinated with 33 bullets pumped into her. He asked me, “Why Sarojaji?” I said, “I don’t know somehow politics is not my cup of tea.” Okay, you promise me one thing, he said. “You will not canvass for anyone in Tamil Nadu.” I was taken aback, I said, “My God, I am not interested in politics, so where is the question of me canvassing.” Then I took a photograph with him. Later, Rajiv Gandhi came to Tamil Nadu for canvassing in Sriperumbudur and was killed on May 21, 1991. At 1 am the news broke out. My son came running to me and said, “Mummy, if you had accepted to canvass, Rajiv Gandhi uncle would have taken you with him. You would also have been on the dais. Then I don’t know what would have happened. As it is we lost our daddy. We would also have lost you.” I was like MGR to the people of Tamil Nadu and if I had asked them to vote for him they would have probably listened to me. SOM: You mentioned that you have great respect for the Mysore Maharajas and you treat them like God. Can you share with us some of the incidences? Saroja Devi: Yes, I like to share a few of my experiences. I went to invite Maharaja Jayachamaraja Wadiyar for my wedding in 1967 as he had agreed to come. But he had gone for hunting and hurt his toes. First we came to the Mysore Palace to invite him. My mother requested him to attend the wedding. She said, “Maharajare, you must come for her wedding. She respects and treats you like a God.” He promised to come and then he enquired about the groom, which place he was from and what he was doing? Then he asked the servants to show us around the Palace. My marriage was fixed for Mar. 1, 1967. He could not attend as he had hurt his leg. Even as the reception was going on in Bengaluru, the Maharaja had sent a plate containing a yellow colour saree with Gandabherunda emblem which I still preserve, a gold ring and fruits. He was a great scholar, he had composed many songs and there was something very divine about him. Then I came for the opening of Sangam theatre in Mysuru for which Srikanta Datta Narasimharaja Wadiyar had come. When he became the MP, he invited me and my son to the Palace. When he stood for Karnataka State Cricket Association (KSCA) election, suddenly I got a call from him one day. I picked up the call and was shocked when he introduced himself and asked me to vote for him. I was the happiest person when Wadiyar won the elections. But I was shocked to hear about his death a few days later. When I thought about Rajamata Pramoda Devi Wadiyar she was just like me suffering in Kittur Chenamma. She is truly a great lady. Even her income tax problems were solved, like mine years ago. I always prayed to God for the welfare of the Maharani and the Maharaja, because I had done the part of Alamelamma in Bhagya Jyothi movie where I utter the curse three times throwing the jewels into the river, “Talakadu Maralagali, Malangi Maduvagali, Mysuru arasarige Makkalagadirali.” (Translated from Kannada it means: May Talakadu be deluged in sand, May Malangi become a whirlpool and May the Mysore Kings never beget children). When I heard now that Trishikha delivered a baby boy, I was on cloud nine. I thanked Goddess Chamundeshwari for this gift. I wear the Chamundeshwari kumkum wherever I go. I felt light-hearted as it was I who had uttered that curse! Even the young Maharaja Yaduveer is very dignified. The way the young couple conducted themselves during the wedding is a role model for every young bride and groom as to how to behave on their wedding day. SOM: Are you conscious of your image as an artiste even now and do a lot of philanthropic work? I am also doing a lot of philanthropic work. On April 21, 1986 my husband passed away. In his name both on his birthday and his death anniversary free eye operations are conducted at Sankar Nethralaya in Chennai. I have also pledged my eyes at Narayana Nethralaya. I have built a school in my mother’s name in Channapatna where 300 to 400 girls study. 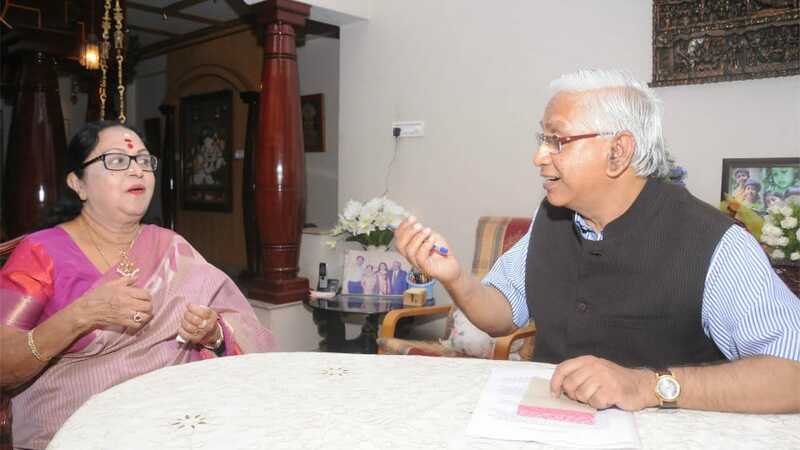 I have also instituted an award in my name called Padma Bushan Dr. B. Saroja Devi National Award. I have established an endowment with Bharatiya Vidya Bhavan (BVB) because I trust them as they carefully guard Indian culture. This year Film Director and Karnataka Chalanachitra Academy Chairman S.V. Rajendra Singh Babu will be conferred the award on May 1 in Bengaluru BVB. Dharmadhikari of Dharmasthala Dr. D. Veerendra Heggade will confer the award. I have no desires left. All I ask for is good health till my last breath.